which coincides with our lunch and rest hour period. At camper drop off, your child will be looking to you for behavioural cues, so do your best to keep a smile on your face, stay positive and excited about Camp, even if you’re really thinking about how much you will miss your child. Allow camp counsellors to connect with your child in their own way. You can help by suggesting things your child is good at or is excited to try at camp. Counselors will help campers transition to camp life by trying an activity together and having them meet and join the cabin group — providing you with a perfect opportunity for a quick goodbye. Ask to see your camper’s activity schedule, which we will have prepared in advance. 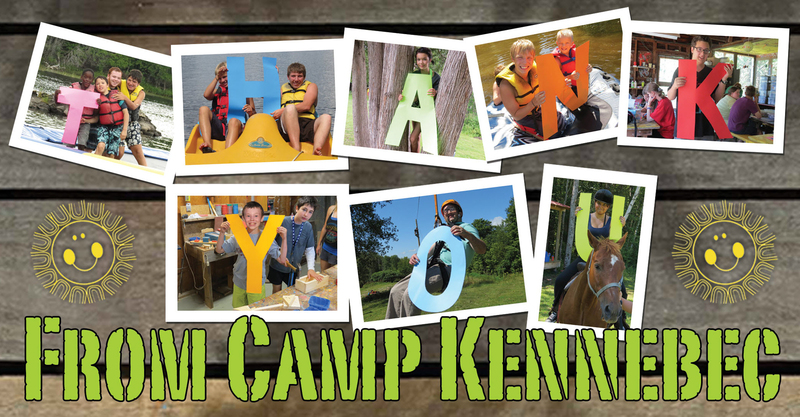 Help your Kennebecer get excited about camp and thinking about how much fun every day will be. All camp sessions end on Saturday, with camper pick up time between 12:00 and 2:00 pm, which coincides with our lunch and rest hour period. Please note, on the last day of camp, August 26, our pick up time is earlier, between 10:30 and 12:00 PM. If it is not raining, we will have all luggage placed on the basketball court adjacent to the parking lot, sorted by cabin name. If it is raining, all the bags will be in the rec hall, again sorted by cabin name. There will be staff on hand to help you locate your Kennebecers’ bags and help load luggage in your vehicle. The last day of camp can be a tough one for campers and staff alike. No one likes to say goodbye. While campers will be very happy to see you, they will be sad to be leaving camp. Please don’t take it personally! And everyone will be tired. No matter what we try to do, there is usually very little sleep on the last night of camp. Everyone who spends time at Camp Kennebec knows that no summer will be exactly like the one they just experienced. And few Kennebecers want the summer to end.